I like being right. A lot. But over the years, I’ve learned that needing to be right all the time comes at a high price. Whether you realize it or not, the need to be right makes you tense, angry and frustrated. It’s exhausting for you and the people around you. It creates suffering in yourself and others. It’s detrimental, if not deadly, to your relationships. Think about it. Who would you rather spend time with, someone who knows everything, or someone who listens to you and asks questions? I feel happier, lighter, and more relaxed. It’s not just an emotional feeling, I feel physically better, calmer. There’s something very freeing in saying, “I don’t know.” I feel less pressure when I have a desire to know more, rather than a need show how much I already know. I’m learning more. When I ask questions instead of always having the answers, I listen better, hear more, and learn more. I have fewer arguments. I don’t get “hooked” so easily when I disagree with someone. I don’t feel as emotionally attached to the outcome. I’m not as judgmental. 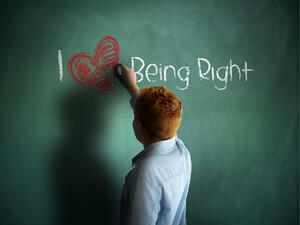 When I’m always right, anyone who disagrees with me is presumed to be wrong. I judge them harshly. I think they’re not as intelligent, open-minded, clever, or educated as I am. They don’t have my common sense. When I let go of that, I’m much kinder and more empathic. I feel more powerful. For me, I think the need to be right has come from a place of wanting more power in my interactions and relationships when, in fact, it has had the opposite effect. There’s a lot more power in being calm, kind, and open, than there is in being defensive, angry and judgmental. So the next time you feel the need to correct someone, stop for a moment and think about. Is it really that important? Don't you think being happy is better than being right?